The amazing story of our church that en masse decided to convert to Judaism. I was born in Honduras, 23 years ago, the oldest of four children. I lived in a neighborhood with all my cousins, on a street named after my mother's ancestors. We attended a church that is non-denominational, but with a strong evangelical bent. When I was three years old, I fell from the second story of my house and dropped head-first onto the concrete, fracturing my skull. I was rushed to the hospital and wasn't moving at all, just gazing off into the distance. The situation was very grave. But then something strange happened. The next day, it was as if nothing had happened. The doctor ordered new x-rays, and there was no sign of any damage  no fracture, not even a scratch. Due to this, our family grew as religious Christians, and throughout my life I was focused on the service of God. When I was eight years old, we moved to America, which offered better financial opportunities. We settled in a suburb of Houston and looked around for a good church to attend, but nothing seemed as good as what we had back in Honduras. Our old church was based in Honduras, but has branches in U.S. cities that have a sizable Central American and Hispanic population. So together with one other family, we requested that the church send us a minister. They sent us a man named Hector Flores, who at the time was still training to be a minister. And that's how our Houston church started  in one room in a house. Minister Flores was fascinated with the Holy Temple, and its predecessor the Tabernacle (Mishkan). He had access to books and resources, and he started teaching Torah ideas that were unique in a Christian setting. 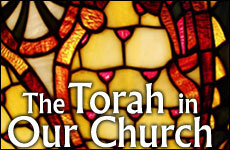 We would spend months and months delving into aspects of the Torah. The church membership grew steadily, as we were very outreach-oriented. The city was divided up into districts and groups, and we would literally go out into the streets and preach to people. During high school, I studied in my church's discipleship program, where they train young people in leadership skills and how to preach. We'd bring people into the church and provide them with family counseling and programs for all ages. It functioned very much like a family. And we would train the new members to reach out and bring more people to church. Of course, people who came to our church for the first time would wonder why we were discussing Jewish topics, and not preaching so much about the typical teachings of Jesus. But Minister Flores continued on his unique path, and the church eventually split into two congregations. We got our own building and bought land to expand. One of the unique customs of our church was something Minister Flores called "festivals of consecration." These were patterned after the festivals in the Torah, where people would bring large donations to fund the church activities. From there it was constant small steps toward Torah: the obligation to tithe, where we'd give 10 percent of our income to church activities. After a while our festivals got assigned Jewish names, like Purim and Shavuot, corresponding to the Jewish holiday they fell close to. This was definitely not consistent with mainstream Christianity. And the closer we got to Torah, the more some congregants became uncomfortable and started to drop out. It was a filtering process. Unbeknownst to us, behind the scenes, Minister Flores was going through an intense personal transition. After much research, he discovered many inconsistencies and contradictions in the New Testament, making the tenets of Christianity untenable. Minister Flores started secretly going to a rabbi, to pester him with questions. Then he'd come back and teach us, slowly getting us closer and closer to Judaism. Soon after, Minister Flores made the decision to convert to Judaism. But he struggled to find a way to tell us, as he didn't want to tear down Christianity without being able to offer us an alternative. So he kept teaching Torah, but in a way that was as subtle as possible. He gradually peeled away the things that were wrong and got us closer to Torah. Our church started replacing Jesus' name with Jewish, Hebrew names of God, and the songs became Hebrew songs. We began to incorporate real Jewish traditions into our festivals, and we even got a Torah scroll for the church. During this process, our biggest resource for information was Aish.com, and its Spanish sister site. At one point the church printed out reams of Aish.com articles on all the holidays, and gave a binder of these articles to each family. Some of the church members became resistant to all these changes, and a number of people dropped out. There were occasional confrontations where people would question the minister, "How far are you going with all this?" And he would simply answer, "As far as the Torah takes us." About six months after Minister Flores made the private decision to convert, my mother had been at a Jewish bookstore and bought the book, "The Real Messiah" by Rabbi Aryeh Kaplan. This book lays out all the evidence for why Jews don't believe in Jesus, in a very scholarly and convincing way. We found that a lot of Christian teachings were based on mistranslations or taking biblical verses out of context. So my mother suspected there was more to this "Torah teaching" than the minister had been letting on. Every Sunday after services, the entire congregation would go together to the park. One Sunday, my mother confronted the minister: "You know more than you're telling us, don't you." He would never lie or deny such a direct question, so he saw this was the right time to reveal his plan to convert. That Sunday, we all stayed at the park for hours and hours, discussing and explaining, until long after dark. At that point, about 100 people wanted to keep studying with the possibility of conversion. But many others took the choice of becoming Bnei Noach, following the seven pillars of human civilization that the Torah presents for non-Jews to observe. Minister Flores explained that any human being who faithfully observes these laws earns a proper place in heaven, and this was an appealing alternative for many church members. My mother, however, wanted to stick with the group who was interested in conversion. So we kept on learning, and eventually our group decided to attend Shabbat services. So one Saturday morning our entire congregation showed up at the United Orthodox Synagogues. It was a bit of a shock to the community, because such a huge influx upset the social balance. But the leader of the synagogue, Rabbi Joseph Radinsky, was like an angel to us; his kindness and sincerity is clear to anyone who knows him. When they saw things were serious, the Houston community sent a Spanish-speaking rabbi, Jose Gomez, to help each family clarify the right path. (He himself had converted 10 years earlier in Houston along with his entire family  parents, siblings, aunts and uncles.) As expected, all of this caused a real stir in the Christian community in Houston. Minister Flores was amongst the first to convert, and since then many of our church members have converted, while others are in the process. My own conversion was finalized a year ago, and my mother and siblings are still in the process. I chose the name "Yosef" because in the Bible, Joseph was the first of his family to go down to Egypt. He established himself and was able to help bring the rest of his family along. My mother says that in our path to conversion, I have been sent ahead as our family's "Yosef." After my conversion, I came to Israel and was really amazed. I saw a variety of Jews, and a whole different side of Judaism. There was something special about everything. I even found myself taking pictures of grass and rocks! I felt truly Jewish for the first time. So where am I today? 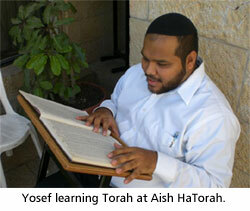 I am studying at the Aish HaTorah yeshiva in the Old City of Jerusalem and I love it. I'm so enthusiastic about everything that I learn, and cannot wait to share it with all my friends and family back home. At this point, my plans for the future are pretty open. I want to continue to study Torah, finish my undergraduate degree, and see what opportunities develop. But one thing I know for sure: I am committed to reaching out to my fellow Jews. If I was fortunate enough to discover this gold mine of spiritual wealth and fulfillment, then those who were born Jewish surely must be given that opportunity. And who knows  just as Aish.com spurred my Jewish growth, maybe this article will be the spark that someone else has been waiting for. http://www.aish.com/sp/so/48932037.html. Thanks are due Joan Swirsky for sending this article to Think-Israel.